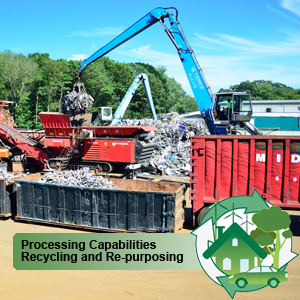 Because we continue to invest in our processing technology at Mid-City Scrap Iron & Salvage, we have been able to increase both the quality and accuracy of our services. Better equipment and state-of-the-art technology has helped us to process scrap more effectively and to produce high-quality end products. By investing in new technology, we minimize emissions, keep our operations moving quickly and are able to operate our plant safely at maximum efficiency. Grading – Most of the materials we purchase consist of unprepared metals. Materials such as aluminum, copper, insulated copper wire, #1 HMS, #2 HMS, light iron, beams, cast iron, brass, plastics and fibrous paper materials including newspaper, mixed paper and cardboard, are all processed, segregated, graded and stored temporarily at our facility. Scrap metal is processed, segregated and graded for type and quality upon receipt. During the segregation process, the material is sorted by type and is then processed into a package for shipping to an end consumer who will re-melt it and make it into a new product. Ferrous (magnetized) metals and non-ferrous metals are also segregated upon receipt. Grinder/Shredder – We operate a Hammel 950 grinder, which is known affectionately as “The Hermanator.” This piece of machinery is used to turn large items into material that is capable of density specifications at steel mills and foundries, as well as to improve hauling efficiency. The non-ferrous and non-metallic materials are separated from the ferrous materials during this process. Running on bio-diesel fuel, our shredder is extremely efficient and can turn large, bulky items into fist-sized pieces in seconds. Most of the scrap that we process is light iron and the grinder breaks this material down, sorting the ferrous and non-ferrous metals through the use of screens and magnetic separating systems. Our shredders give us the ability to recover all valuable metals that pass through our facility and then make a product that can be shipped to any steel mill or foundry via truck, rail or shipping container. The product is then melted down to make new products. Shears – Large pieces of unprepared scrap over 5 feet in length, such as bridge beams, rebar, barges, channel, plate, rail, pipe, steel beams or tanks cannot be processed by our shredders. We cut these items to smaller specifications through the use, crane-mounted shears, of hand torches and our 550-ton Harris stationary guillotine shear. Balers – Mid-City Scrap operates a couple of different baler types that are designed to compress materials at high pressure to create uniformly-sized dense blocks, which are called “bales,” to be used for specific purposes. Our non-ferrous (non-magnetic) balers range from a small hand-fed machine to a much larger 2-RAM IPS upstroke baler that can compress everything from aluminum to insulated copper wire as well as other non-ferrous materials. These balers can also process all grades of fiber and plastic, which will produce a wire-wrapped bale as big as 4,000 pounds. Our hydraulic baler is used to process lighter ferrous materials, such as sheet iron, tin cans, stampings, clippings and excess trimmings, making a 2x2x variable and using up to 2100 psi. Heavy materials like scrap steel and automobiles can be processed using our grinder and/or our hydraulic baler. The specialized equipment at Mid-City Scrap helps us to maximize the efficiency of our vehicle recycling process. Any hazardous parts, such as tires, batteries and fluids, are removed in advance by our de-pollution staff to ensure that every part of the vehicle is recycled and that all pollutants are removed in accordance with industry standards. Once this part of the recycling is complete, the vehicles will go through the grinding or baling process. Our facility also has the ability to process electrical equipment, such as refrigerators or other appliances, according to industry standards. We remove and recycle the CFC’s from the appliances before the materials are processed in our grinder or baler. Our facility also has specialized equipment that is designed to lift and process heavy, large-sized materials. We have the ability to cut down and process large items such as silos, tanks, heavy machinery, bridge sections, boilers and other extremely large industrial scrap. Our plant also recycles plastic materials. Plastics are graded and baled to a uniform size before they are bulk-shipped to a plastic re-processing facility. The types of plastics we accept include plastics 1-5 and 7, such as PET, PETE, HDPE, LDPE, PP and mixed-rigid plastic, such as bins, toys and heavy-duty plastic products. We also purchase, grade and process catalytic converters as a means of recycling and recovering precious metals such as platinum, palladium and rhodium, which are all used to reduce engine emissions. Once these precious metals are extracted, they are then refined and reused. Once we process these materials at Mid-City Scrap Iron & Salvage, they are ready to be transported. We have access to rails and can transport these materials anywhere in the United States. We use a machine called a “tipper,” which enables us to load material into 20-foot or 40-foot shipping containers for shipping worldwide to the best markets. This gives us the ability to maximize the value of our processed materials to ensure that our clients are compensated at peak market prices.